I usually go to the polls to vote early in the morning. This year, I decided to wait until after 2:00 PM. When I arrived at the St. Paul A.M.E. Church Polling Place, I was please to note that the usual electioneering involving signs plastered all over public property (as has happened in previous years) had not taken place. I came to that judgement too quickly, as it turned out. As usual, after voting, I spent time cleaning up the grounds of the polling place and the littered section of Old Sanford Street in front of it. You don't see any litter in the above photo because by then I had already collected three bags of it, and dumped it in the trash barrels everyone else in East Orange seems to have difficulty locating or else they are lousy shots. I also took my annual photo of the missing lamp post sidewalk hazard that the city of East Orange seems to have difficulty in locating and repairing with bricks, even though I first reported it in 2014 and started photographing it in 2015. I was just getting ready to leave, when I noticed the man shown in the top photo busy taping a Line A Democrat Poster to a city lamp post in violation of City Code 238-4. Apparently, while I had been busy doing the city's job of cleaning up the street and sidewalk around the polling place, he and his partner sitting in the car (yellow circle in below photo) were busy violating that code several times, and had a handful of posters that would have ended up on other public lamp posts if they hadn't seen me taking photos and left in a hurry. I doubt very much that Crooked Hillary will pay the city fine for the code violations, or come to East Orange with a clean-up crew to remove the signs tomorrow and repair any damage done to city lamp posts. I also doubt that her collegues, Leroy Jones and Lester Taylor, will pay any attention to this problem that they have been ignoring for the past several years. We live in a city that is run by corrupt politicians, who, like Crooked Hillary, are interested only in themselves and their personal foundations funded by the East Orange tax payers, and continue their ambitions to bleed the city dry in their acquisition of political power over our property and our lives. Sorry, but someone had to say it. The Toy Giveaway may seem harmless, until you realize that it is socialist indoctrination to make us see our politicians as "Santa Claus." Except that Santa Claus never funded himself with taxpayer money and never had political ambitions before socialists saw that they could use the image of Santa Claus to bring in the useful idiots that keep them in power over the rest of us. 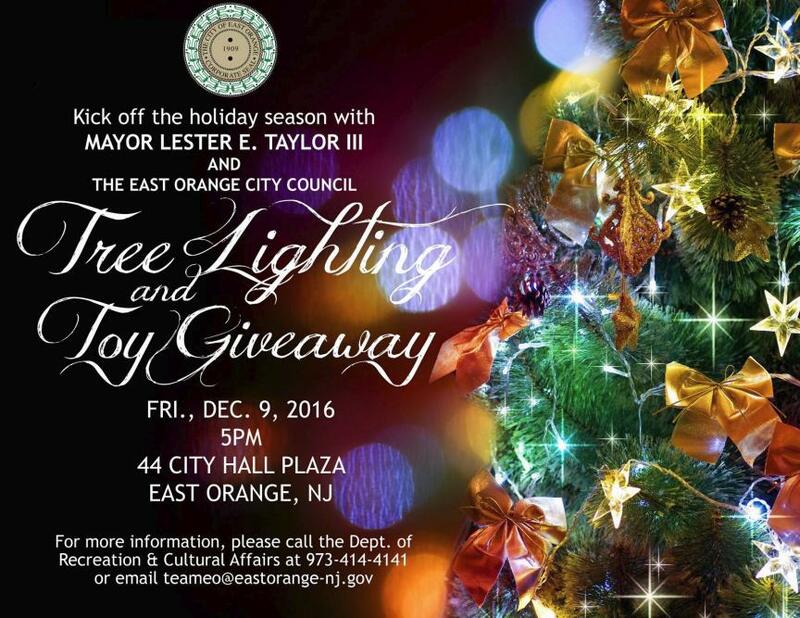 Merry Christmas, East Orange. You are getting what you deserve. What lesson in civic responsibility do you suppose the children who crossed here on their way to the government public school (Cicely Tyson School) learned this morning? That the elites who run this city (like their patron "saint" Crooked Hillary) are above the laws and codes they themselves write and require the rest of us to obey? Congratulations to Donald Trump for winning the election and becoming the next President of the United States in spite of the shenannigans of our Line A Democrats. Now I will have to keep track of him and see if he keeps his Contract with America, or if he turns out to be like Lester Taylor the third. 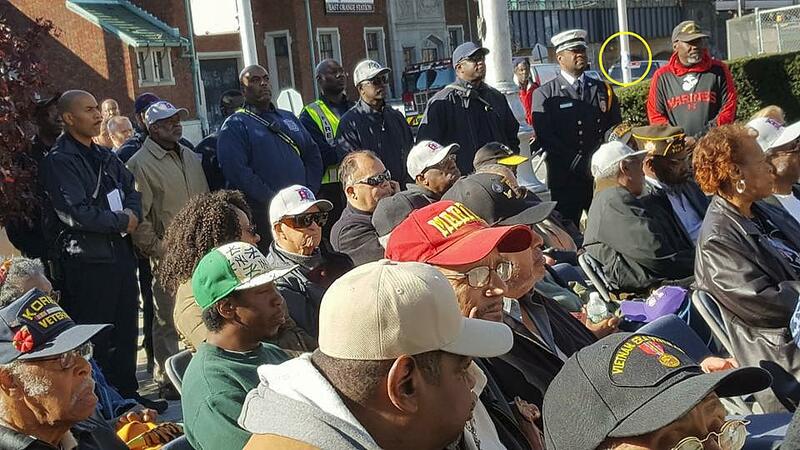 A sad note was that 3 days later, on Veterans Day, all the signs and posters were still in place on the city lamp posts, in sight of everyone who attended the Veterans Day Ceremony at City Hall Plaza, including the mayor and members of city council and all the veterans. Outside the Veteran's Ceremony at the Memorial. Inside the Veterans' Ceremony from a photo on the city's own Facebook page. I added the yellow circle showing the lamp post violation. Our politicians and "leaders" have no sense of honor, or decency or civic responsibility. Remember this when it comes time for them to be re-elected in June of 2017. 11/14/16 - Continue adding to the fines *. That makes seven days of violations, and two for each lamp post.